Some would like to build their own; some would rather ride. Either way we've got you covered. The 113-cubic-inch fuel-injected V-twin engine that powers it takes a back seat to no V-twin when it comes to power and reliability. 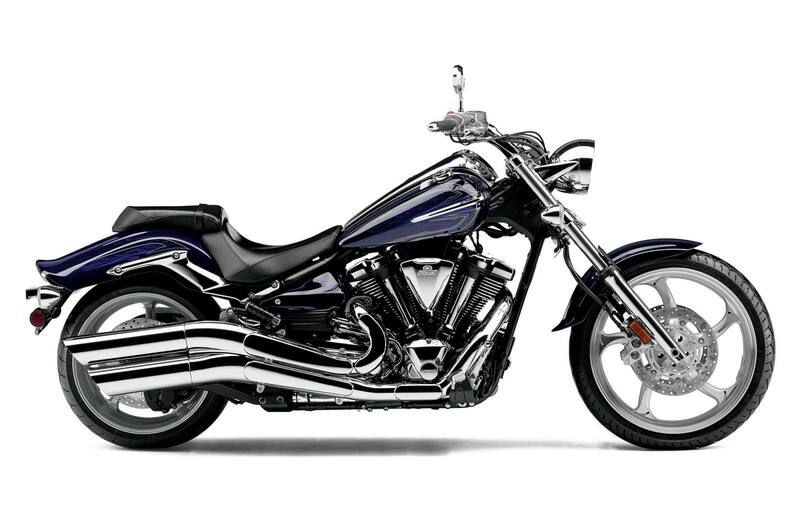 And the rest of the chopper-inspired Raider S is pure Star, designed and engineered by the world's best bike builders. "S" model gets even more chrome: chrome triple clamps, fork sliders, air box cover, engine covers, headlight housing, handlebar risers, and more. Don't forget your shades. • “S” model gets even more chrome: chrome triple clamps, fork sliders, air box cover, engine covers, headlight housing, handlebar risers, etc. • A 6-degree yoke angle—the first ever on a Star® Motorcycle—makes it possible to achieve that custom look as well as neutral handling and straight-line cruisability: 33-degree rake plus 6 degrees yoke angle gives total rake of 39 degrees and 102mm of trail. • 5-spoke wheels carry a 120/70-21-inch bias tire up front, and a wide, 210/40-18 radial out back—the tallest and widest ever on a Star. • Estimated 42 mpg* means this cruiser can go the distance between fill-ups. • 113-cubic-inch (1854cc) air-cooled, OHV with 4 valves per cylinder, pushrod 48-degree V-twin pumps out max torque at just 2500 rpm and max power at 4500 rpm for powerful, relaxed cruising. • Four pushrod-activated valves and two spark plugs per cylinder provide optimum combustion efficiency along with classically beautiful engine architecture. • Computer-controlled, twin-bore fuel injection monitors multiple engine parameters to calculate perfect mixture under all conditions; wide-angle 12-hole fuel injectors provide excellent atomization. • A 3.5-liter airbox is hidden in the area below the fuel tank for great performance and clean styling. • Two-into-one-into-two exhaust with Exhaust Ultimate Power valve (EXUP®) inside boosts torque in the 2500~3500-rpm range. • All-aluminum cast frame is lightweight, rigid and tuned for light, athletic handling. A light, Controlled-Fill, aluminum swingarm casting complements the bike’s lithe style. • Low, sculpted seat holds the rider in place, and pullback bars reach back to enforce a casual, urban cruising style. • A 6-degree yoke angle—the first ever on a street-legal Star Motorcycle—makes it possible to achieve that custom look as well as neutral handling and straight-line cruisability: 33-degree rake plus 6 degrees yoke angle gives total rake of 39 degrees and 102mm of trail. • Custom 5-spoke wheels carry a 120/70-21-inch bias tire up front, and a wide, 210/40-18 radial out back—the tallest and widest ever on a Star. • 46mm fork tubes serve a sweet appearance and an excellent ride through 5.1 inches of wheel travel. • Flangeless fuel tank carries a full 4.2 gallons of fuel. • Front brake master cylinder with integrated lever operates a pair of 298mm front discs squeezed by strong monoblock calipers for excellent power and feel, with a 310mm disc out back. • Strong, light and narrow belt final drive contains embedded carbon fiber for even greater strength. • Wiring harness uses super-slim wires for compactness, are lighter weight and switchgear wiring is routed inside the handlebar for a clean appearance. • Jewel-like fit and finish, and Star quality paint, chrome and attention to detail are evident all over the Raider S.
• Cool, tank-mounted instrumentation complements the custom look, and contains analog speedometer and fuel gauge, along with twin digital tripmeters, odometer and self-diagnostics. • Bright multireflector headlight, LED taillight, and amber turn signals behind clear lenses give a custom look. • 02 sensor and three-way catalyst reduce emissions.